We know, you're on schedule this summer. There is so much you'd like to do, so many places you'd like to visit and so little time. Relax. 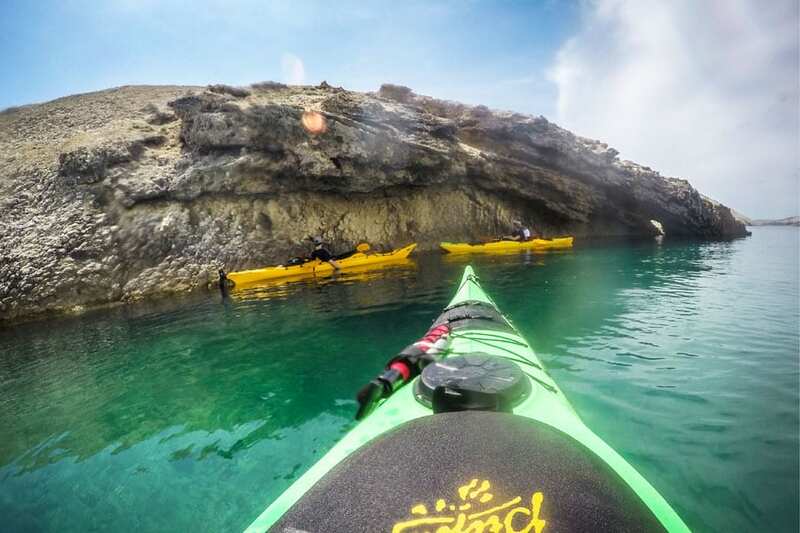 If sea kayaking rates high on your must-do list, we can make it a half day tour. 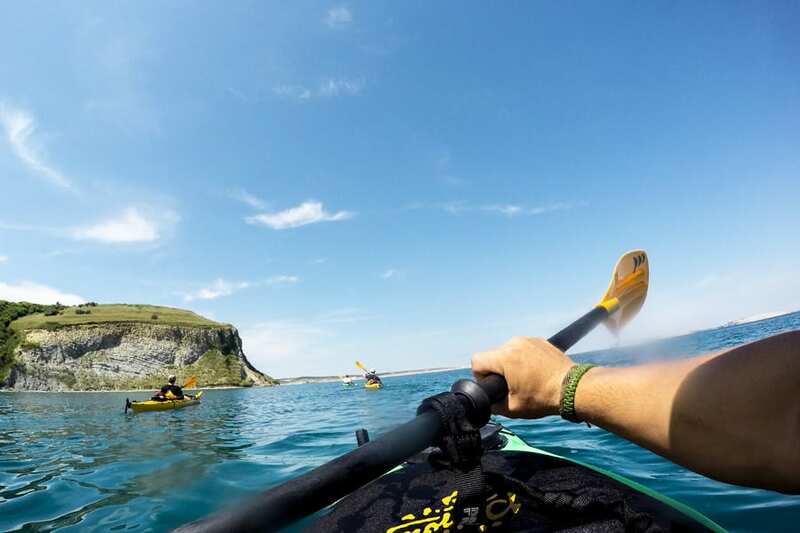 Sea kayaking tours are offered all year round on selected days. Check free slots by clicking on our green button or send us an inquiry for CUSTOM ADVENTURE. Seakayaking is nice. Meditative in the still sea, turns exciting as the waves begin to rise. The views are fantastic, it all looks different from an open sea perspective. And the positive effects for body and soul - the training, the breeding, the relaxation…well…do we really have to point them all out? 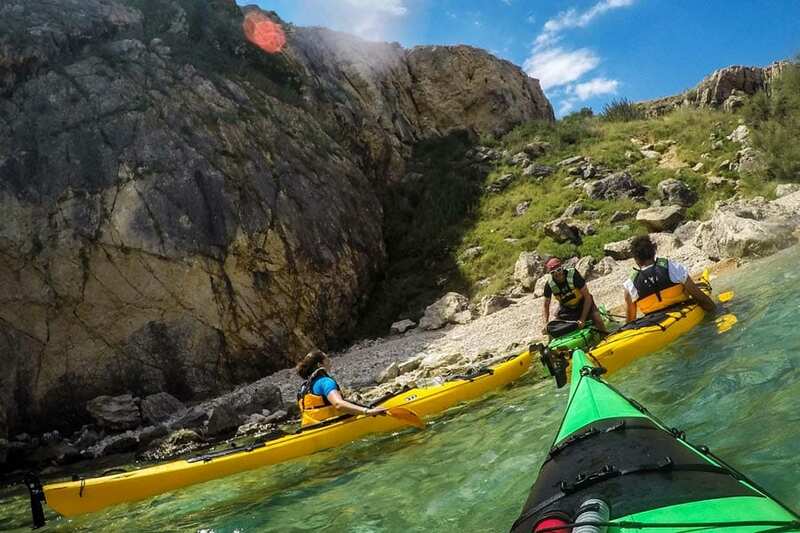 This is a perfect adventure to enjoy the day on see with group of friends, your girlfriend or a family also a perfect way to get in a close touch with the sea. This tour is not only for those of you who don't have time for a whole day adventure. 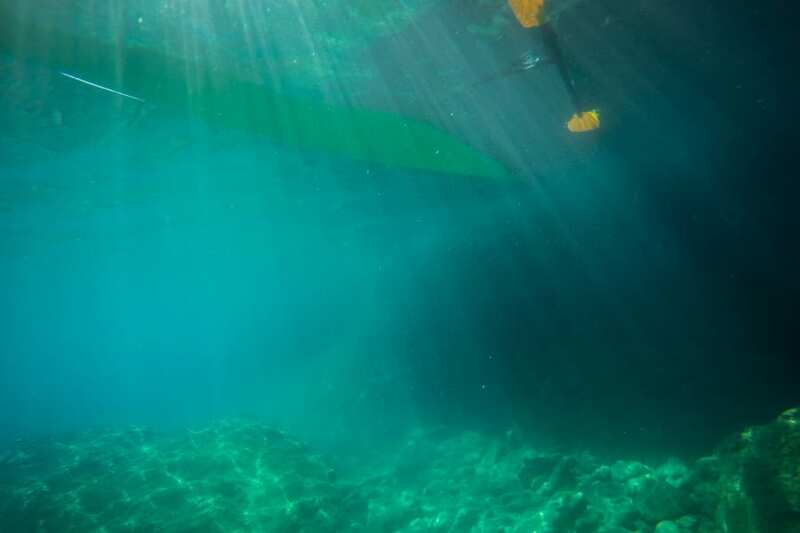 It is also for total beginners, the ones with no paddling experience, the ones who are not in the greatest sport shape of their lives, even for non-swimmers or anyone having any kind of a problem with the sea or the deep. A life-changing experience! It was not once that we got this kind of reaction after the tour. And it really is a mellow way to deal with some of your personal fears. Tour is highly adjustable. Your guide will follow your interests and downsize the tour to suit your rhythm. 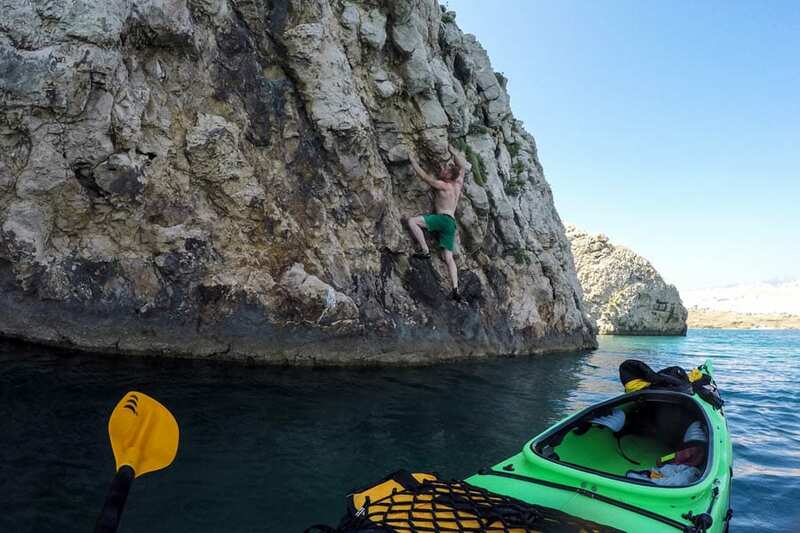 It lasts from three to four hours (or even shorter on your demand), covers the area of two beautiful lagunas – Rtina Miočić laguna and Ljubač laguna – and includes other activities like deep-water-free-solo climbing, cliff diving, snorkeling, picnic……or just ice-cream and coffee. Please, leave all your belongings, specially the values, at safe place. Bring only clothes that you can get wet in, a cover for your head, suns creme and enough of food and water for a couple of hours. You can choose from a morning session and an afternoon session. In the summer, mornings are usually peaceful. 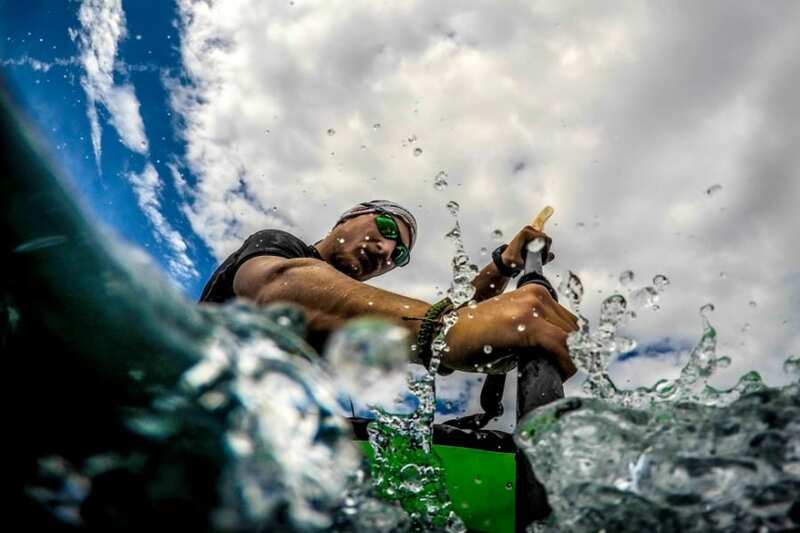 So, if you'd like to experience meditative side of sea kayaking, we recommend the morning session. Around noon, the wind starts blowing slightly and the sea rises. 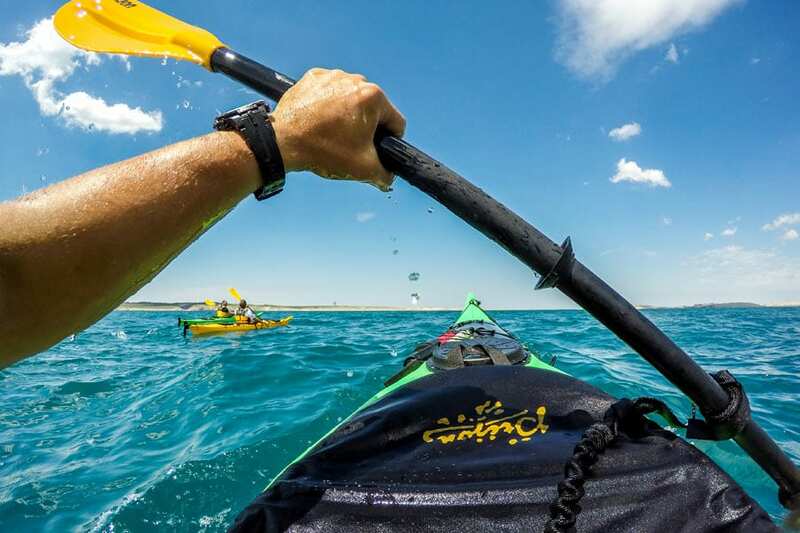 The afternoon session is more suitable for those to take the more adventurous side of sea kayaking. Meeting is at 15PM. 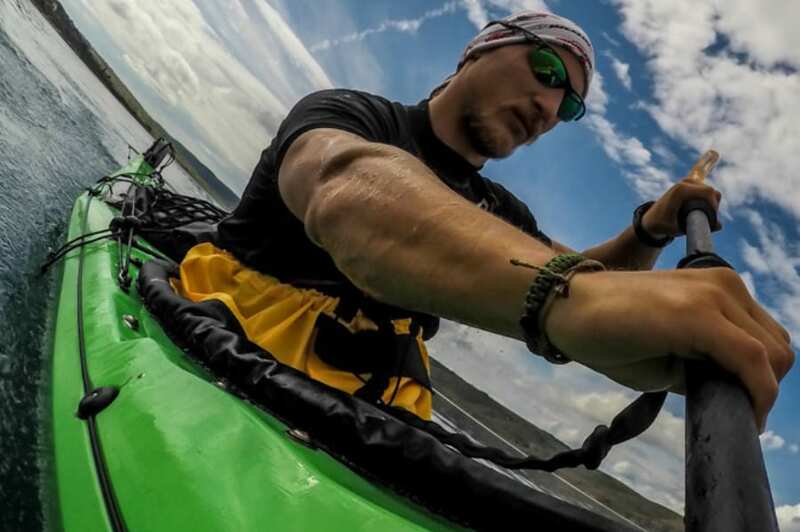 Again, after a welcome coffee and a short course on gear, paddling and rescuing techniques, we set up a plan and take off. Special extra for this afternoon session is a sunset comeback! We meet at Rtina Miočić bay for a welcoming coffee. Take care to bring your own suncream, something to cover your head, clothes you can get wet in and enough food and water. Your guide will provide the same, but sometimes it's hard to predict someone's own gastronomical preferences for an adventure. 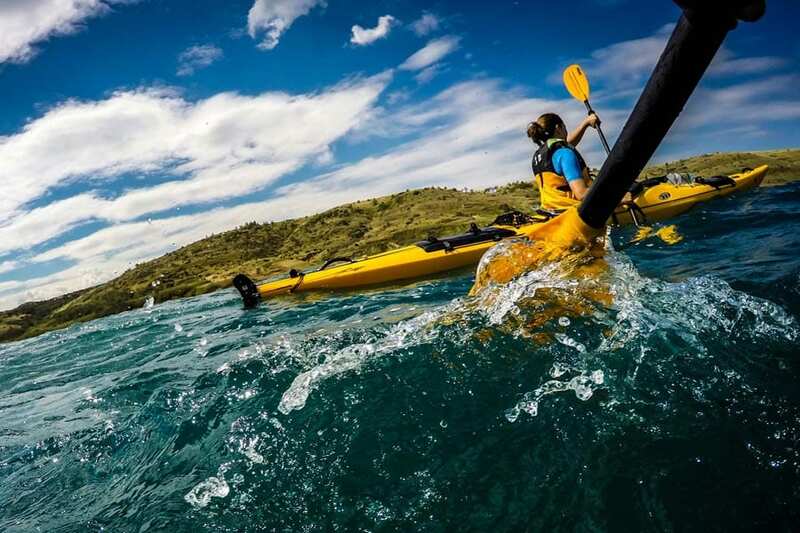 According to your previous experience with seakayaking, your guide will take a short course on gear, paddling techniques, getting used to stability in a closed cockpit, launching and landing kayak. 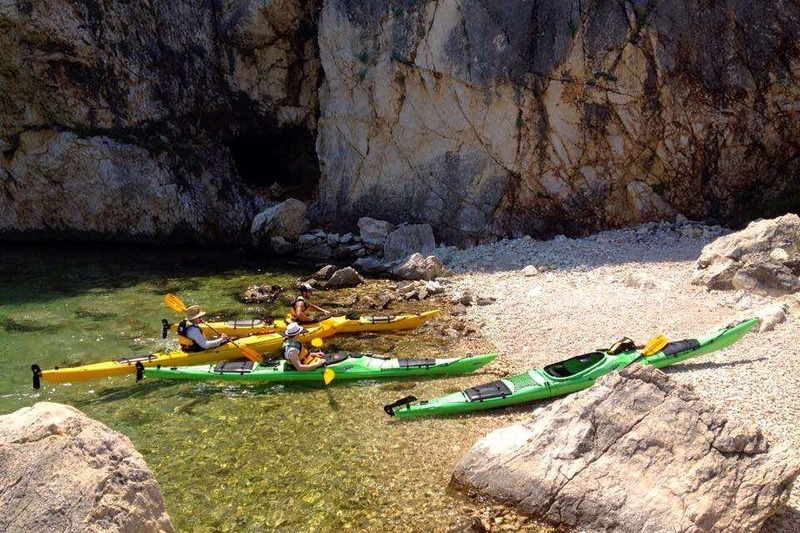 ADV uses fully equipped Prijon sea kayaks suitable for multi day voyages. 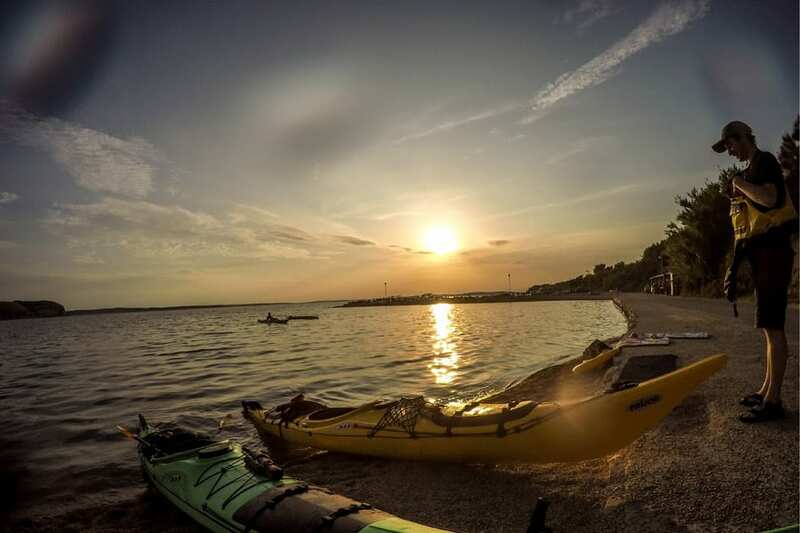 We start paddling through our day full of adventure. Artificial cave drilled in to reach a drinkable water from a spring. But it is not the cave we paddled here for. It's the cliffs surrounding it. The cliffs you can climb up from a very kayak itself, with no climbing gear but the climbing shoes to make it a real deep-water- free-solo climbing experience. Climb up the cliff, then cliff dive from the top of it. Or any height you feel like. Here we also enjoy our picnic – sandwich, fruit or a snack. The waves are still not full on. We continue with paddling. 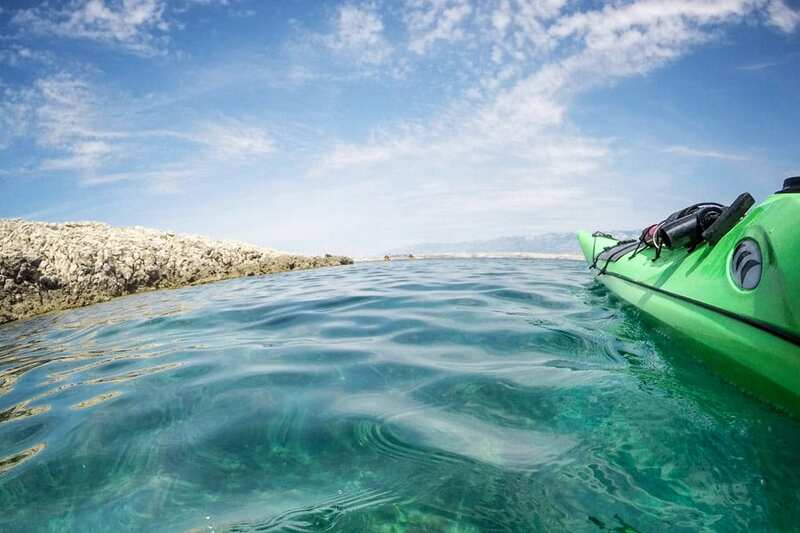 We'll paddle back smoothly home with view on mountain Velebit and Pag bridge, back to Rtina Miočić bay. And don't let the splashing stop!